Autumn is the time when our saffron crocus blossom in the garden. You can see the bright red stamens that must be carefully hand-collected from each blossom. 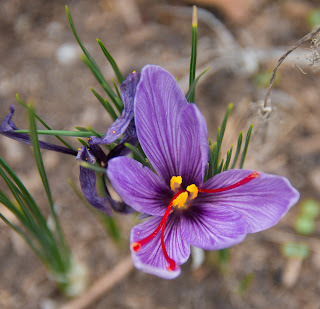 It is little wonder Saffron costs several hundred dollars an ounce- just imagine how many flowers it would take to get just a single ounce of saffron! We certainly won’t have that large a harvest, but the subtle floral aroma and deep orange color make it a fun ingredient to play with.